Hey Everyone, I'm having problems with a AW4 trans shifting. I pulled the motor and trans out of a 1995 Cherokee 2wd and put it in my 1977 AMC Gremlin. The motor runs fine but I'm having trouble getting the trans cooperate. I forgot to get the TCM out of the 95 so I got one from the local salvage yard. Went to change the linkage on the shaft and the end broke off. So I replaced the shift shaft. To replace the shaft I had to remove the valve body. With valve body down I took this opportunity to install a Transgo shift kit with new solenoids. Trans holds fine in park, no problems in reverse and neutral. When put into drive you can feel it go into gear very softly, when I accelerate it drags as if it's got a stall converter in it. Manually shifting, it seems to only have second gear. No 1st, 3rd or 4th gear. Tested newly installed shift solenoids found one to be bad. Replaced all 3 again (testing all before installing) and I'm still having the same problem. Not sure were to go next. Transmissions have always been my weak point. Any help would be greatly appreciated. Google ATSG JEEP AW4 manual. There are a few copies online for free or you can buy it. Acts like it's starting out in 3rd gear. Check for power to the TCU. If you pull the lever down to 1-2 position, does it start out normally from a stop? 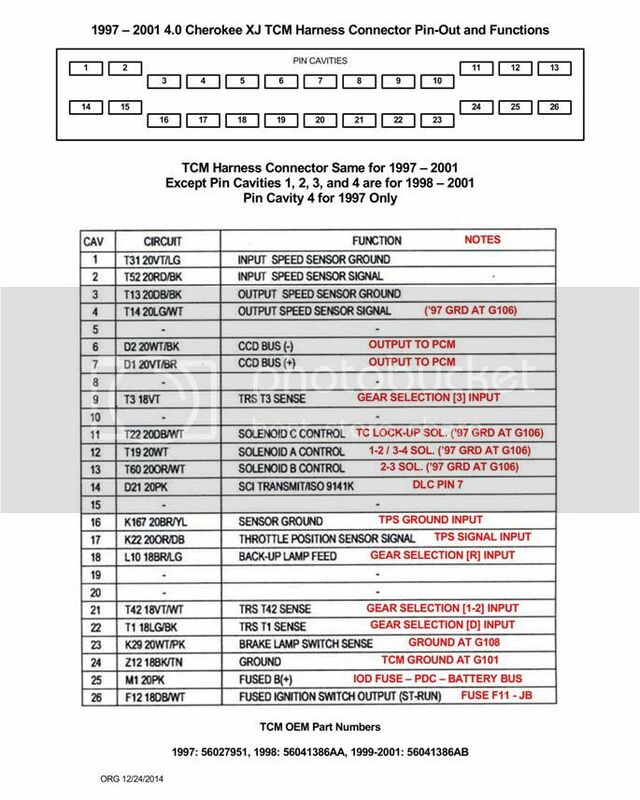 Hey Cruiser54, The TCU has power to the red wire all the time and power to the yellow wire with the key on. With connector hooked up it also has power at the blue and white wire, which I believe is solenoid 1. As far the shifting it won't move until the shifted is put into low. It starts moving after the RPM's get to 3000 as if it has a stall converter in it. Once moving if you shift into second no change then into third and forth it feels like it is in neutral. Is the TCU getting signals from the shifter? Yes, it has a new neutral safety switch and is lined up with the proper positions. The solenoids can be ohms tested without removing them. 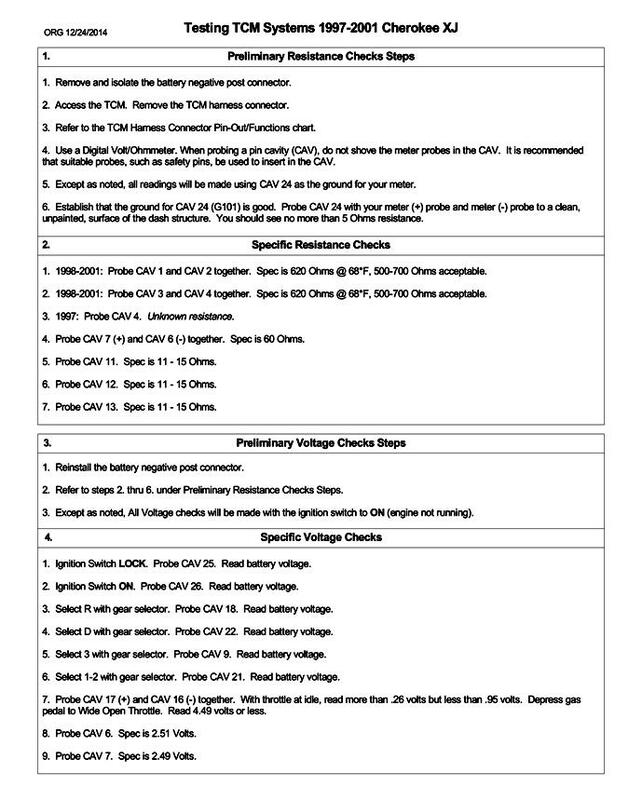 Thanks, fb97xj1 for the diagram but i'm working on a 1995 and the wiring is different. I was able to get the 95 and run the tests on it. I tested the solenoids for this posting and I found solenoid 2 was bad so i replaced all 3 with new ones and tested each one before replacing them. They 13.1, 13.0, 13.2. Testing them now and solenoid 1 was 2.64, solenoid 2 was 13.2 and solenoid 3 was 13.1. So I will replace solenoid 1 again and retest. It's sad you buy a new part that tests good before installing then ends up bad. I let you guys know in a couple of days if it was the problem or not. I completely missed the year, obviously lol. Thats what i get for speed reading. Saw 2001 to the left and ran with it. Hey Guys, tested everything I could. Replaced the valve body with one that was set up to hold in first gear when shifting manually. When manually shifting, trans will hold in first gear till manually shifted into second, trans works fine in second but will not up shift manually or automatically to third and no fourth. It feels like it is just free wheeling. The trans shifts the same with the TCM connected or not. Checked the kick down cable seemed to be set correctly, also checked the TPS and the voltage readings are within specs. Don't know if I missed something in the wiring or what. I thought of just swapping the trans out for a 700r4 but thats starting a different headache. Is there anyway to make the aw4 a complete manual shift? Did you hook the speed sensor up? It won't shift automatically if it doesn't know the speed it's moving. There is a mod someone has done on here where he put pushbuttons on the solenoids so he could trigger each one manually and not use the TCU. You should get to D (3rd) with the TCU unplugged and the manual shifter but you'll have no overdrive. Here's a link to the manual-Hopefully you have this. Last edited by 67 GMC; 07-02-2018 at 07:11 AM. I forgot to get the TCM out of the 95 so I got one from the local salvage yard. Is there a difference between the TCU for a 2WD Cherokee and a 4WD Cherokee? Never see 2WD Cherokees up here so most junkyards would be stocked with 4WD Cherokees. Last edited by 67 GMC; 07-02-2018 at 07:17 AM. I haven't been able to find out if the TCU is different between 2wd and 4wd. When I pulled the engine and trans I pulled it in one piece with the harness still connected. The only thing was I forgot to get the TCU from that vehicle so I got one from the local bone yard, but they never said anything about different units. When I got the TCU they gave me the connector from that vehicle and the wire colors all matched with the colors in the harness. I'll search again to see if I can find out about the TCU's. The link above only mentioned the 2wd but no details. What matters is that the harness plug and the TCU plug both have the same color plastic.